Housing, Homelessness and HAP – all with disability. For those of you following my blog, you know that I have been desperately, and unsuccessfully, searching for a new home to rent using HAP (the rental assistance program). In my last piece, I mentioned learning that my sons and I didn’t get selected for a home we applied for because the owner knew someone else who had applied. Well, as irony would so have it, yesterday – upon returning from the Homeless Demonstration in Dublin, I got word that again we didn’t get selected for a house we viewed just the day before. The reason given was that there were many suitable applicants and she could only choose one. The disappointment I feel is nearly beyond description. I am left wondering if landlords have a heart at all. 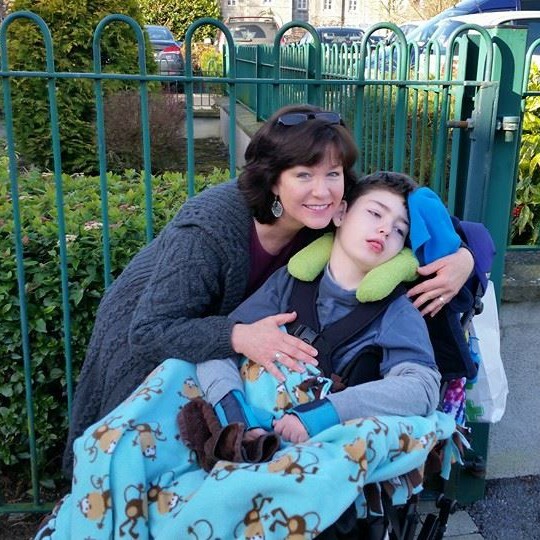 The rental market in Dublin and the commuter belt area where I live – and need to stay in for Brendan’s medical care and services – in north county Kildare is brutal. I’ve seen group viewings of only a 20 minute timeframe. I’ve seen houses for rent in the area at 3 and 4 times the price compared to other areas of the country. I’ve had estate agents tell me the owners won’t remove the furniture out of what would be Brendan Bjorn’s bedroom so that I could put in his medical bed and equipment. Seriously, it cannot get much more inconsiderate and selfish than that, can it? Finding a house to rent that is suitable for a person with disability and all their needs is painfully hard to do. Don’t get me wrong, there are suitable houses out there. I’ve seen a number of very suitable bungalows for rent – but at twice the amount allotted by HAP, if not more. This leaves me asking WHAT ARE FAMILIES LIKE MINE TO DO? If we become homeless, Tusla will be notified because of Brendan Bjorn’s very fragile, complex disabilities and health. I understand that, and frankly, as a mental health professional who has dedicated her entire career to helping children, I fully agree with that happening. Having said that, if Tusla is called in because we become homeless, that would likely ruin any chances I have of one day re-entering my profession working with children. It is a double-edged sword of which I don’t want to be impaled. I believe in the power of the people. I believe in politics being able to bring about positive change. I belong to a political party that shares this belief and works toward that greater good for the people of Ireland. While I used my seldom given respite nursing time to march alongside these individuals, I felt the community spirit that is what will save this lovely country of ours. It has to save it. Families are suffering far too much and depend on folks like this to help them. Families are being torn apart, discarded, and forgotten. And dare I say, those of us who must add disability into our family equation and our search for appropriate disabled-accessible housing are suffering even more so. My 9 year old son, God bless him, is being hit hard emotionally by this insecure, unsettled, search for a long-term house to call home. He is struggling, forced to be a part of adult issues of which no child should ever have to concern themselves. It isn’t fair on him, and as his mother I feel terrible guilt and pain at not being able to relieve him of all his worries. And then there is my precious angel Brendan Bjorn, who lives in a constant emotional world of innocent happiness and doesn’t realise the storm we are in. That is certainly one aspect of this journey for which I shall be forever grateful. How do you view my son? What do you really think of carers like me? Let’s talk reform.